Napoleon called Louis Étienne Saint-Denis (his French-born servant) Mameluke Ali and required him to dress in the style of the mamelukes, the slave horsemen of the Ottoman Empire. Saint-Denis went to Russia with Napoleon, joined Napoleon on Elba, returned to France for the “Hundred Days,” and accompanied Napoleon into exile on St. Helena, where he served as second valet and as Napoleon’s librarian. Saint-Denis became a clerk in a notary’s office in Paris. In 1806, his father secured him a position in Napoleon’s stables. In December 1811, Saint-Denis entered the Emperor’s personal service. Louis Étienne Saint-Denis was an assistant to Napoleon’s bodyguard and valet, Roustam Raza. Born in Tbilisi, Georgia, to Armenian parents, Roustam (or Roustan or Rustam or Rostom) was captured by slave dealers when he was a boy. After being sold into slavery at Constantinople, he was taken to Egypt and enrolled as a Mameluke (or Mameluk or Mamluke or Mamluk). 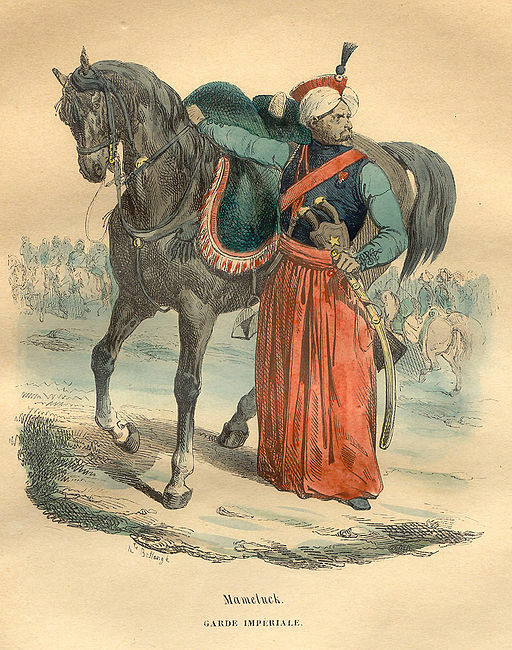 The Mamelukes were the slave horsemen of the Ottoman Empire. In 1768, they became the rulers of Egypt. Although the Mameluke cavalry was among the best in the East, it was no match for the French army, which invaded Egypt under the command of then General Bonaparte in 1798. Still, Napoleon was impressed by the Mamelukes’ courage and fighting skills. He formed a special Mameluke corps in the French army, eventually attached to the Chasseurs-à-Cheval of the Imperial Guard. For details, see “The Georgian Mameluks in Egypt” by Alexander Mikaberidze on the Napoleon Series website and/or, in French, the discussion on the “Histoire Pour Tous” site. While Napoleon was in Egypt, Sheik El-Becri of Cairo gave him the gift of an Arabian horse and Roustam. Napoleon appreciated Roustam’s dedication, enjoyed his exoticism and viewed him as a living testimony to his oriental campaign. Roustam served Napoleon from 1799 until the Emperor’s first abdication in 1814. Roustam did not accompany Napoleon to Elba. He later claimed that he feared Napoleon would commit suicide, and that he would be blamed for his death. 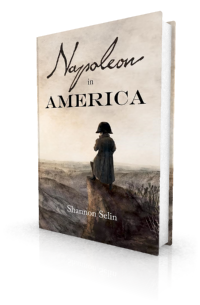 Napoleon, however, viewed Roustam’s failure to join him in exile as a betrayal. When Napoleon returned to power in 1815, he refused to take Roustam back into service. For some of Roustam’s memories of Napoleon, see this May 7, 1911 New York Times article. Since Saint-Denis was appointed as a second to Roustam, Napoleon made Saint-Denis a Mameluke, insisted that he be dressed as a Mameluke, and gave him the name of Ali. As “Mameluke Ali,” Saint-Denis went to Russia with Napoleon, joined Napoleon on Elba, returned to France for the “Hundred Days,” and accompanied Napoleon into exile on St. Helena, where he served as second valet and as Napoleon’s librarian. On October 18, 1819, Saint-Denis married Mary Hall, a young English Catholic who was governess to the Bertrand children. On July 31, 1820 they had a daughter, Clémence, whose godparents were Charles de Montholon and Fanny Bertrand. In Napoleon in America, Louis Étienne Saint-Denis is one of the members of Napoleon’s household questioned by Governor Hudson Lowe about Napoleon’s disappearance from his residence of Longwood. After Napoleon’s death in 1821, Saint-Denis returned to France with his family. Though Napoleon left Saint-Denis a sizeable sum in his will, this was not paid immediately. To make ends meet, Saint-Denis left Mary and Clémence temporarily at Versailles, while he worked at a riding school in Paris. A second daughter, Isabelle, was born June 11, 1826, and a third, Napoléone Mathilde, was born in 1827. Eventually the family moved to Sens, in Burgundy. Saint-Denis’ description of Napoleon’s brief flourish of gardening on St. Helena in 1819 is also amusing, as illustrated by these excerpts. Professor G. Michaut, “Introduction,” in Louis Étienne Saint-Denis, Napoleon from the Tuileries to St. Helena; Personal Recollections of the Emperor’s Second Mamluke and Valet, Louis Etienne St. Denis (known as Ali), translated by Frank Hunter Potter, New York and London: Harper & Brothers, 1922, p. vii. Louis Étienne Saint-Denis, Napoleon from the Tuileries to St. Helena, pp. 2-4. Saint-Denis, Napoleon from the Tuileries to St. Helena, p. 122. Saint-Denis, Napoleon from the Tuileries to St. Helena, p. 208. Saint-Denis, Napoleon from the Tuileries to St. Helena, p. 211. Saint-Denis, Napoleon from the Tuileries to St. Helena, p. xii. It did not take me long to master my new employment . . . which [demanded doing] nothing three-quarters of the day.